Genre is a funny old thing. Not funny ha ha, perhaps, but bear with me. As writers, especially in the fickle world of self-publishing, we are expected to stick rigidly to one niche for the whole of our careers. It’s very weird. I can’t really think of any other artistic medium where this is true. Over the course of twelve albums The Beatles covered so much ground they had to invent new ground for them to fit. Steven Soderbergh changes genre with every single film, taking his voice and applying it to a radically different canvas. Hell, even painters have ‘periods’ wherein they’re expected to radically develop their style. Not so for the lowly author. So much of modern publishing advice boils down to ‘find your niche, settle down into it, and take it as far as you can.’ You can’t go from, say, historical fiction to military space opera. And if you do, you’d damn well better crack open a new pen name on every occasion. ‘Readers are genre loyal’ they say. This seems weird to me, not just because I read across a wide range of genres myself (as do most people I know) but because I struggle with where every single damn one of my own books should sit. The Blood on the Motorway series, for example, is definitely Post-Apocalyptic. Rootin, tootin, end of the world stuff. That is the setting, the overriding trope that governs everything within it. But beyond that? Well, it definitely has elements of horror in there, not least in the murderous psychotics the storm sees fit to spare. Then there’s the storm itself, which brings in a decidedly sci-fi element. Then you have shades of dark humour, the bonds of friendship, dystopian world building, and even the barest sprinkling of romance. Oh, and a nice dog. Those are the elements, but as for the style? Well, it’s nigh on impossible for an author to determine that for themselves – it’s a bit like asking a singer to describe their own voice. They probably have no idea how it sounds to other people. This is where other people come in. Of all the feedback I’ve had on the books so far, one thing comes up again and again. Page turner. Thrill ride. Couldn’t put it down. Now, obviously, this is the kind of feedback that makes me clap my hands excitedly like a seal about to get a fishy treat, but it makes sense, too. Every writer is a magpie. We take all the disparate shiny things that input our brains from childhood on, and turn them into a sparkly new nest. Now, I never set out to write thrillers. I set out to write a horror novel, but I read too many Tom Clancy novels as a kid. Too many John Grisham novels, back before Hunter S Thompson and Douglas Coupland blew my mind. I love a good page turner. In light of all this feedback , when it came time to redo the covers for the Blood series, I decided to retire the old strapline – ‘an apocalyptic tale of murder and stale sandwiches.’ I really like that, but it was confusing potential readers, some of whom thought it was some kind of ‘culinary novel.’ No, seriously. I decided to rebrand it – An Apocalyptic Thriller. 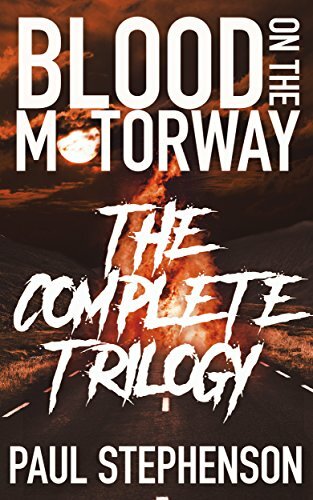 Now, since I’m embracing that thriller tag, I’ve teamed up with a bunch of other fantastic thriller writers to offer a free download of the first book in the Blood on the Motorway trilogy alongside over 60 other thrilling reads. So whether you’re into horror, sci-fi, the end of the world, or just like a good page turner, why not check it out today?